The Integrated Solution Group, Inc.
FROM BOSTON AND POINTS SOUTH: I-93 north from Boston to exit 36 (Washington St.). Turn left on Montvale, go 1/2 mile, turn right on Washington Street. Go about 1 mile, through one set of lights, then turn left on Cedar Street. Turn into the first driveway on the right (Chestnut Green). We are in the building on the right, first floor. 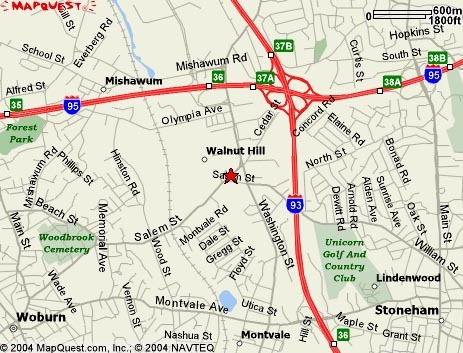 FROM LAWRENCE AND POINTS NORTH: I-93 south to exit 37A (I-95 south), immediately take the Washington Street exit, at the end of the ramp turn right, go up the hill to the signal, turn right onto Washington Street. Stay on Washington about 3/4 mile, turn right onto Cedar Street. Turn into the first driveway on the right (Chestnut Green). We are in the building on the right, first floor. FROM FOXBOROUGH AND POINTS SOUTH: I-95 north to exit 36 (Washington St.). Turn right onto Washington Street. Stay on Washington about 1/2 mile, turn right onto Cedar Street. Turn into the first driveway on the right (Chestnut Green). We are in the building on the right, first floor. FROM GLOUCESTER AND POINTS NORTH: I-95 south to exit 36 (Washington St.), at the end of the ramp turn right, go up the hill to the signal, turn right (south) onto Washington Street. Stay on Washington about 3/4 mile, turn right onto Cedar Street. Turn into the first driveway on the right (Chestnut Green). We are in the building on the right, first floor. FROM WORCESTER AND POINTS WEST: Mass Pike (I-90) to Exit 14. (Rte.128/I95N) to Exit 36 (Washington St). at the end of the ramp turn right, go up the hill and turn right at the traffic signal,(south) onto Washington Street. Stay on Washington about 3/4 mile, turn right onto Cedar Street. Turn into the first driveway on the right( Chestnut Green). We are in the building on the right, first floor.